for the latest Olympic event. I’m ready for the next Olympics. That is, if short-circuit pram pushing becomes an Olympic event. It wasn’t until we moved interstate that we started having ‘evening complications’ in getting our one-year-old daughter to sleep. Instead of going peacefully to la la land she would cry and scream as she stood rattling her cot walls. From the noise, you’d think we’d just dropped her into a cage of lions. Attempting a ‘sleep drive’, a popular method for putting restless children to sleep, only worked out to be beneficial for the petrol companies as our daughter would always wake during the transfer from the car. The best solution we came up with was to wheel her around the house in the pram until she fell asleep and then delicately transfer her into her cot. There was a good circuit for doing evening pram laps at my in-laws house, where we were temporarily staying. It went through the dining room, lounge room, and kitchen and then back through the dining room to begin another triangular lap. Round and round (and round) I went, creating all sorts of rocking motions and rhythmic bumps. While this first stage of this endurance event worked fairly well, stages two and three were a little trickier. Her room was actually upstairs, so we’d have to carry the pram, like Cleopatra on her port-a-throne, up the staircase, which also happened to have a 90o turn half way up. Once we made it upstairs to her room, and if she remained asleep, the final stage began: transferring her from pram to cot. If this wasn’t carried out as quickly, quietly and smoothly as possible there was a high probability the entire pram-a-thon would have to be restarted. While the physical distance wasn’t that much of a challenge, it was thinking up what you could do to amuse yourself while you walked around in circles - in the dark. Most of the time, if I wasn’t seeing how long a screeching sound I could make with the rubber tyres while turning sharply on the kitchen tiles, I would try and figure out how far I’d walked that night. After a few weeks, I just bought one of those bike speed and distance computers, and set it up on the pram. I discovered I usually walked over a kilometer’s worth of circles by the time she fell asleep. One infamous night I set an all time record for one evenings push. Having to restart twice due to a failed transfer attempts, I ended up completing 3km worth of 20 meter laps – or 150 laps. After we moved to our own house, 10 or so more kilometers of circuits later, we let her cry herself to sleep for two or three nights and, what do you know, she stopped the fussing and went to bed peacefully. It was one of those “Hooray” but “Why didn’t we try that to begin with” kind of moments. Perhaps if we were at our own house at the start we might have let her cry it out to begin with. Then we wouldn’t have needed to worry about disturbing the others in the house with all the screaming. 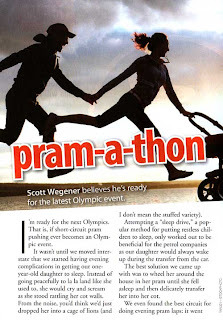 So, yep, sign me up for the short-circuit pram pushing Olympic event, and perhaps pram lifting too (as long as the event schedules doesn’t clash). While there’s many conclusions that I’ve learnt during my circular pilgrimages, like wheel grooves in your in-law’s plush carpet will disappear by morning, and the neighbors come home about 9:40pm every Wednesday night, there’s one lesson that actually handsome value. It is this: all trials that seem endless will come to an end. And I don’t just mean things like looming exams, having to ask your farther-in-law-to-be for his daughter’s hand in marriage or diarrhea while on a long overnight hike. I mean ALL trials, including ‘permanent’ disabilities, longing for deceased loved ones, having a terminal illness or even the tragedy of beginning to losing your hair. While these are all of varying hardship to endure, and seemingly without hope of resolve, there is a happy conclusion available for everyone. Towards the end of the Bible there’s one particular promise for everyone who is in the midst of enduring an epic trial that gives hope. Revelation 21:4 says Jesus will wipe every tear from your eyes. There will be no more death or mourning or crying or pain, for the old order of things has passed away. According to the words found in John 3:16 this incredible promise is available to everyone who simply believes in Jesus. Perhaps the only remaining tragedy to endure in heaven will be finally having an awesome in-mansion circuit to push the pram around, but never needing to.